Let us pray: Almighty God, 500 years you brought your teaching and practice of the forgiveness of sins by grace through faith in Jesus back to the center of the church. You have also given the same to us. Continue to keep this teaching central to this congregation but also to your whole church on earth; in the name of Jesus. Amen. 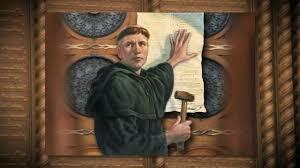 The 95 Theses were posted by a German monk 500 years ago. The first of those theses is this: “Our Lord and Master Jesus Christ, when He said repent, willed that the whole life of believers should be repentance” end of quote. No matter how bad you are, the eternal God desires your salvation. He gave His only begotten Son, Jesus, to die for you. All of you. Even if you are the worst sinner, the most vile, wretched, messed up, God-hating, neighbor-despising sinner ever, your evil deeds no longer need to damn you. Nothing you have thought, said, or done is beyond the redemption of Jesus’ blood. Now, that’s Good News! That no matter what sins you’ve committed, no matter how sinful you really are, Jesus died for you. No matter how good you are, the eternal God desires your salvation through Jesus. And this may come as a shock. And, in fact, this is the real awesome good news that Martin Luther and the Reformation brought to light. That’s good news because even if you can say the right words that you don’t earn your way to heaven by being good, our Old Adam still believes God will like you better if you’re good. If you’re well-behaved, God won’t let bad things happen to you. When you do nice things, that makes God happy with you. Dear brothers and sisters in Christ, let me say this as clear as possible. The Father forgives all your sins by grace through faith in Jesus. AND the Father forgives all your good works, too, by grace through faith in Jesus! He forgives you for thinking that when you do something good, that makes you a good person. It all comes down to this. whether you are good or bad: are you in Christ or not? Outside of and apart from faith in Jesus, there is nothing in you but sin, death, and judgment. In Christ, where His Word has declared you forgiven, you are righteousness, innocent, and blessed. This is what the Jews who believed in Jesus didn’t get. And it’s the thing we miss too. They refused to believe they were slaves of sin. If you sin, you’re a slave of sin. Jesus sets you free. But sin isn’t just doing bad things. It’s also thinking your good things make you a good person. We tend to think of sin in terms of doing bad and evil and wicked things. True enough. But our real demonstration of unbelief is thinking that any good things we do balance out the bad. That thinking we’re not people who actually deserve eternal death and judgment. But Jesus tells them plainly. If the Son sets you free, you will be free indeed. So He does. By your baptism into His death for you. By your faith in Jesus for you. You want to know who’s really good? Jesus. Perfect even. Spotless and without blemish. Sinless. You want to know who’s bad? Really bad? Worst sinner ever? Jesus! Because your sins are His, carried to Calvary. Bled and died for. It is by that payment for sin and the defeat of death by rising on Easter that the Son sets you free from the slavery of sin. Slavery to sin means unbelief. But now, in Christ, you are promised that the consequence of your unbelief is not eternal. So how do you know whether you are in Christ? Well, we don’t believe our sins because those might lead us to conclude that we’re nothing but lost! On the other hand, we don’t believe our good works either. Those might persuade us that we’re pretty good people who don’t really actually need Jesus that much. So how do you know? How do you know that you are a child of God? His promises. The promise made at the font by water and the Spirit. The promise made when the pastor absolves you. The promise made when He gives you His body and blood to eat. The promise of “for the forgiveness of your sins.” These gifts, water, word, body and blood—these gifts tell you what God has to say. Your goodness or badness is of no eternal consequence. What matters is Jesus. What He did. What He gives. Therefore, let us end with the first of the 95 Theses: “Our Lord and Master Jesus Christ, when He said repent, willed that the whole life of believers should be repentance” for I declare unto you again this morning, your sins are forgiven in the name of the Father and of the Son and of the Holy Spirit. Amen.